If you haven’t been in a retail store lately, beware of what may be lurking in the isles. While I am still trying to decide on a costume to wear for Halloween or how to decorate the house for trick or treaters, I am horrified at how quickly Christmas decorations have made it to the shelves this year. 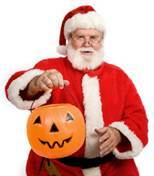 When it comes to the holiday season, for me it always kicked off with Halloween and ended with the New Year’s celebration. But now each holiday is just a blur. Granted, I am much older and have more responsibilities now, but I still yearn for those carefree days as a kid when I looked forward to the holidays. Now the holidays seem more stressful and the arrive like a new task that is beeping at me from whatever electronic device I am currently using as if it is an appointment I am running late for. When it comes to managing holiday stress, some of the common things that can stress one out include: time, family, and finances. Holiday events and tasks can take up a lot of your free time. Know you limitations and try some of these to make you holiday more enjoyable for you and everyone. – Set expectations. What does the holiday mean for you? What do you want the holiday to be like? Be realistic and focus on those things that you value and find joy in. – Prioritize your expectations. Make time for those that are important to you and then take care of the others is you have the time and energy. – Rethink traditions. They may take up a lot of time long after they have lost their meaning to you or your family. Depending on your family, or where they are located, tensions can flare up quickly when you get together for the holidays. Everyone has a different idea on how to celebrate the holidays and sometimes those ideas will cause conflict. – Use communication. Effectively express your feelings without putting the other on the defensive. If you don’t choose to talk about why you are upset, others may take it personally that you are avoiding them and tensions can continue to escalate from there. – Listen to others. Just like you would want others to hear why you are upset or stressed, be prepared to listen to them when they are expressing the same. Don’t try to fix everything (unless they ask), often if you let them know that they are heard, that may be all they want. – Get support. Have someone that you can talk to. If your family can’t be with you during the holidays for one reason or another, reach out to other friends or family for emotion support. – Make a realistic budget and stick to it. Know what you have to spend before you go shopping. If you end up picking up a “little” something extra here and there, soon all those “little” gifts add up. – Teach about financial limitations. After teaching your family, practice what you preach! You would be surprised what your kids observe and pick‐up. – Shrink your gift list. Ask yourself if you can give fewer or less expensive gifts without hurting anyone’s feelings. If you have a large extended family, consider drawing names among relatives to give gifts to one or two people instead of everybody. For my spouse and I, our holidays have often resembled the movie Four Christmases with us driving over 6 hours or more to visit multiple households of extended family and to take part in family traditions. Upon our return from our “holiday vacation” we would be wishing we had another week just to recover. We have changed this approach and decided to make fewer trips home by inviting family to join us. More importantly, we are starting our own traditions. We are taking more time to be a kid again and enjoy the scenery around us, notice local decorations, take part in holiday events in the Black Hills. What I want for Christmas is to enjoy Halloween without running into garlands, holiday lights, and trees. Please help us hold off until after Thanksgiving to even think about sending Holiday Cards and decorating the house. This entry was posted in Life Skills / Relationship Assistance by ellsworthafrc. Bookmark the permalink.